Apple's lineup of iPhones next year will introduce a larger-screened LCD model, measuring more than 6 inches, according to a report today by The Bell (via The Korea Herald). It's unclear whether this size will be an additional offering to the current LCD iPhone lineup (including 4.7-inch and 5.5-inch models), or if it's replacing these sizes completely. In May we heard the first rumor about Apple's 2018 iPhones, which at the time focused solely on the OLED versions and did not mention the LCD models. This rumor stated that the devices would come in 5.28-inch and 6.46-inch OLED screen sizes. 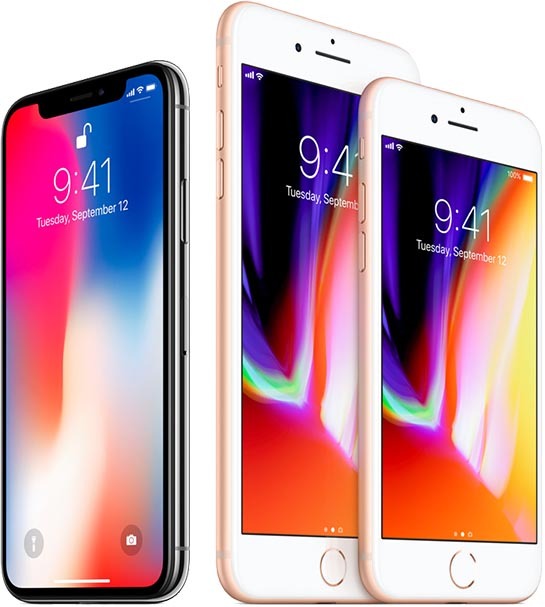 A subsequent report by ETNews suggested that Apple had ditched the small 5.28-inch size and moved to focus on 5.85-inch and 6.46-inch models, and today's report corroborates those claims. This means that next year Apple could potentially launch the following iPhones: a 5.8-inch OLED model, a 6.46-inch "Plus" OLED model, and at least one LCD model that measures 6 inches (or larger). Apple has decided to ditch the smallest 5.28-inch OLED iPhone next year, while adding a larger -- possibly more than 6 inches -- LCD model into the full lineup, according to The Bell on Sept. 25. Citing local parts makers, the report said Apple had originally given panel orders to Samsung Display, its sole OLED supplier, under a plan to launch three OLED iPhones next year -- 5.28-, 5.85-, and 6.46-inch models. But the report said the development work for the 5.28-inch model has recently been suspended possibly due to the low marketability of the smaller version. The Bell cites local parts makers who claimed that Apple decided to scrap the 5.28-inch model of next year's iPhone "due to the low marketability" of such a small-screened device. Apple is said to have given OLED orders to Samsung Display for the other two sizes. Apple will continue sourcing 2018's LCD iPhone screens from supplier Japan Display, which already includes panel orders for the new larger screen size. According to industry watchers, Apple's decision to ditch the 5.28-inch iPhone 9 is due to the "popularity of larger-screen phones for video viewing." A 6.46-inch iPhone would be larger than Samsung's 6.3-inch Galaxy Note 8. In regards to when Apple might switch to OLED-only iPhones, 2019 has been eyed as the year that Apple might finally make that transition. Isn't this what almost killed Apple in the 90s? I agree here they should have 3 phones next year. iPhone SE OLED, iPhone OLED and Plus OLED all with edge to edge and the new front FaceID camera modual. A 6.46-inch iPhone with OLED display would be much nicer. Why not a miniature version of the iPX? I'd grab a 4 or 4.5" version instantly. The 5.28 size in an X format could be almost as small as the SE in physical size. I would love that, and it seems a lot of others would from comments on these forums. Don't understand the lack of marketability. Though portrait-view lists will show more information on the iPhone X. So I dunno. I'm ready to get hands-on.... when will the iPhone X be in stores?